Being prepared is the best way to be sure you don’t default to fast food or other less healthy options for dinner. If you are like me, I always start out the day or the week with great intentions of well thought out meals, but reality hits around 6:00 every evening and my exhaustion or lack of time trumps my intentions. With these items in the freezer, I have a quick start to a variety of entree options like soups, casseroles, pasta dishes and more. How many times do we begin to prepare dinner and get to that frozen rock of raw ground beef and think to ourselves “ugh…that is going to take time and effort to thaw and cook before I even get to the recipe I planned for tonight.” Or the raw chicken that needs to be baked and you need a meal on the table in less than 30 minutes. Start with a large spaghetti pot. Put about an inch of water in the base and place the pasta basket into the base. Fill the basket with 5 pounds of ground beef or ground turkey. Cover and bring the water to a boil. Reduce heat to a simmer. This will create steam that will cook the meat in the basket. Stir the meat occasionally until it is no longer pink in the middle. The more you stir it, the more fine the ground beef will break up. When the meat is no longer pink, it’s done. The fat will have dripped down into the boiling water so the meat will not need to be drained. Some spaghetti pots can hold as much as 10 pounds of ground beef. If yours will hold it, go ahead and cook 10 pounds instead of 5! If not, just do this 2 times and stock up for the month. Let the meat cool and then scoop it into freezer bags. 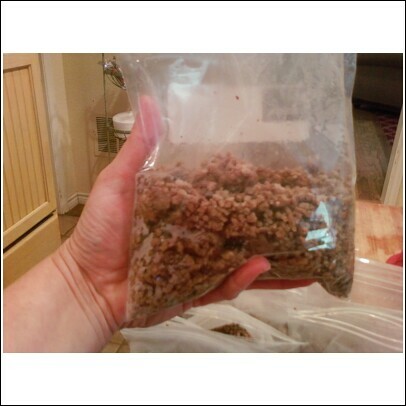 Divide it into 1 pound portions and place in quart sized freezer bags. Two heaping measuring cups equals about 1 pound cooked ground meat. Schedule a freezer refill on a day when you have an easy meal planned for dinner that requires ground beef (like chili or a quick soup). While the bulk portion of ground beef is steaming, prepare your meal at the same time. While dinner is enjoyed, the rest of the ground beef is cooling. Enlist an extra set of hands after dinner to help bag the ground beef while you are cleaning up the dinner dishes. I prefer cooking with boneless, skinless chicken breasts. They may be a little more expensive than bone in or whole chickens, but usually efficiency trumps pennies in my daily schedule. Not that I don’t need to be conscience of our family budget, but some of the most expensive chicken in my freezer is the chicken that requires more effort than I have in energy to get it cooked. I’ve been known to let whole chickens that I got on sale sit in my freezer for months and months. Sure I got a great deal, but the money spent is still being wasted as long as those birds continue to chill in their raw state! If you are inclined to bake whole hens in your oven…by all means ~ fill that oven up and bake away! In fact, plan one hen for dinner and the rest can be deboned and shredded after the meal. Don’t forget to enlist the other free hands in the house to help with deboning the chicken so it’s done quickly! Heaping 2 cup portions put into quart sized freezer bags = 1 pound portions of shredded chicken to be used as needed. For those who are inclined to skip the bones, here is my favorite way to fill my freezer with portioned bags of shredded chicken. Fill the bottom portion of the pot with about 1-2 inches of water. 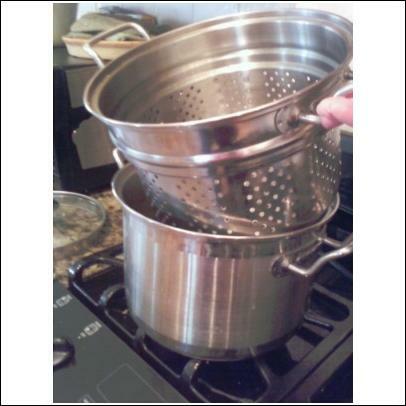 Then insert the steamer pot, cover and bring the water to a boil. Now it is ready to be filled with chicken breasts, covered and steamed. Fill the pot as full as you can. During the steaming time, remove the lid and use long handled tongs to move pieces from the bottom to the top to even out the cooking process. When these are finished, let them cool and then shred or chop them into small pieces. 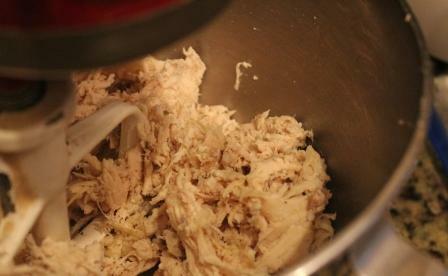 TIME SAVING TIP: The cooked chicken into a standing mixer on a lower speed for quick shredding. 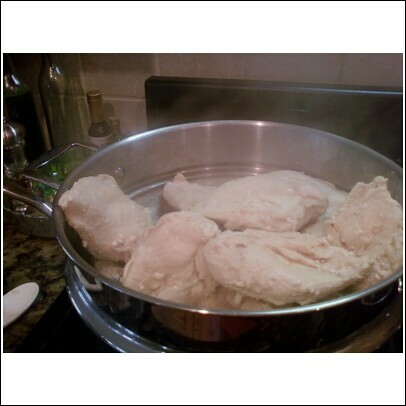 Now the chicken is ready to be stored in quart sized freezer bags in one pound portions. Two heaping cups = about 1 pound cooked chicken. This makes the frozen portions perfect for most recipes that call for precooked chicken. If you have a recipe that calls for canned chicken…this is way better!